Tionna treated us to a great Ethiopian dinner tonight. Let’s start with the basics. Traditional Ethiopian food uses a spongy pancake-like bread called injera to scoop the wat (stew) or whatever else. We have made injera before, but the Caucasian non-fermented way. Giant Eagle in Stow carries Teff (the main ingredient in injera), and while this turned out well, it tended to crumble and not flex. We have since purchased from Zelalem Injera. We found their injera to be closer to Ethiopia than Empress Taytu, as Zelalem’s is sort of sour. Don’t get me wrong – we do love Empress! 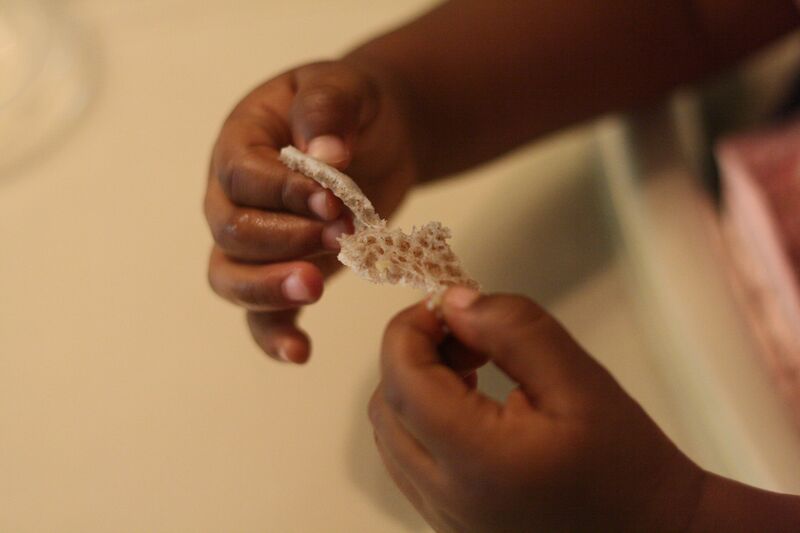 The injera freezes well, and Tionna can bring it back to life by warming it in the microwave with some water. Defrosting it in the fridge will kill it. T made our favorite two dishes – Dora Wat (chicken stew) and Kik Alich’a (yellow split peas). The dora wat is made with berbere, which is a main spice for most Ethiopian cooking. We have regular and spicy berbere from Ethiopia, but even the regular is too hot for all my girls, so T makes an approximation with fewer chile peppers. Ethiopians love their super finely chopped onions, so the onion puree looks sort of like mashed potatoes before it goes in. Somehow they can chop that finely by hand. We really do need a lesson from Empress. The girls ate it all, especially loving the injera. We do too. One CSA ingredient was used – the delicious garlic. While we love the traditional food, we couldn’t eat it 3 meals per day like most Ethiopians. Then again, maybe we could… The only improvements we could have made would be to have St. George instead of Sierra Nevada, and actually being in Ethiopia. It truly is a lovely country, and we’ll leave you with my favorite place – Awassa Lake. This entry was posted in Babies Food, Travel and tagged Ethiopia on July 24, 2011 by bgalizio. What an amazing post! 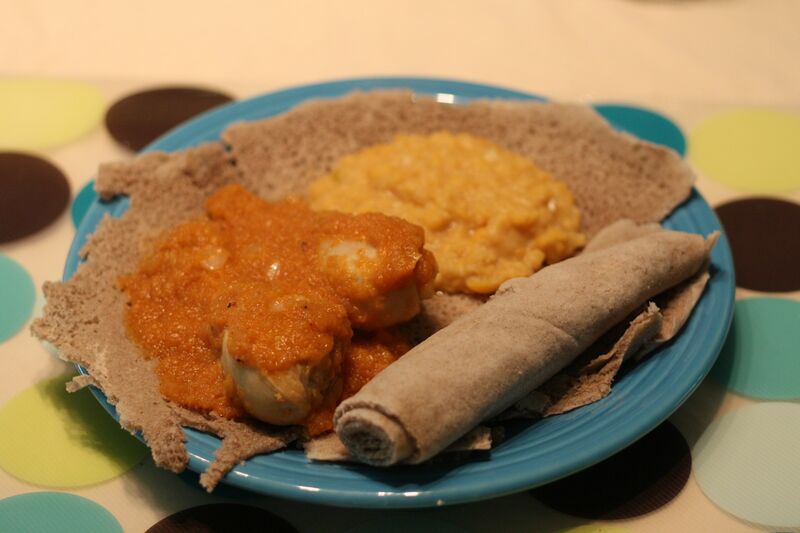 The food sounds fantastic, and it was great to learn a bit about Ethiopian food. And then the cute picture of the little one and the amazing landscape were just beautiful. The wide shot of the lake looks too perfect – like a painting – it must have been so incredible to see it in person. Thanks for sharing! I agree the pictures are so incredible and breathtaking. I love the knowledge you hqve gained and are sharing about Ethopian cooking. This is a beautiful post. Love the insight into another way of thinking about meals. It looks so great. We will have to try it sometime. Oh Ben, thank you for that. It gives us some insite to your wonderful journey. I loved the pictures as well. And the precious girls you brought home to all of us. Tionna is amazing, cooking foods from the girls homeland. You guys impress me everyday! I agree with everyone’s comments, and I also can attest to how delicious Ethiopian food is, although I have only eaten a couple of times at the Empress Taytu. It would be fun sometime for all of us to go together- we would pretty much take over the entire place! Is the injera difficult to make? I want to try to make it soon. 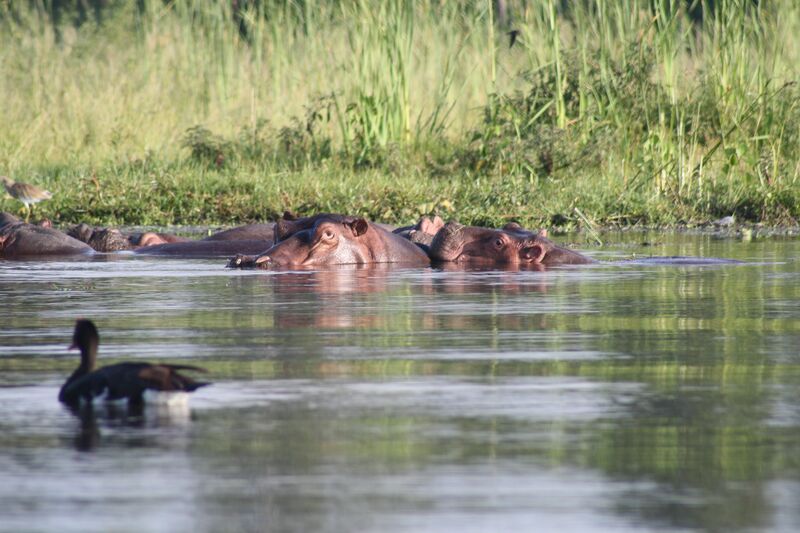 I honestly cannot believe that you were that close to hippos when I also have seen photos of the rather tiny boat that you were in! I know that you were in very good hands in Ethiopia though. Someday your Dad and I are going to Lake Awassa! Oh, I just looked at the Injera store and I see that I can order it too, so I don’t have to make it. Are the stews hard to make? I don’t know if they’re difficult because Tionna makes them! I think they’re relatively easy, but do take time. There aren’t too many dishes for me to clean up afterwards. She has perfected the recipes over time too, so it’s gotten progressively easier for her. Does not matter how many times I see the photos it still is so striking to me. The 1st photo of the like really looks like a painting. I am with Mom in wanting to go. Question what is the difference between the 2 types of injera at the store? I also find it interesting the differences in the tastes of the bread. It makes me want to hit the Empress someday soon. I like everyone else appreciates your taking the precious time to post this it is an enlightening experience for all here. Thanks. I agree – that’s one of my favorite photos from that trip. It was early morning, looking out from the balcony of our room at the Haile Resort. 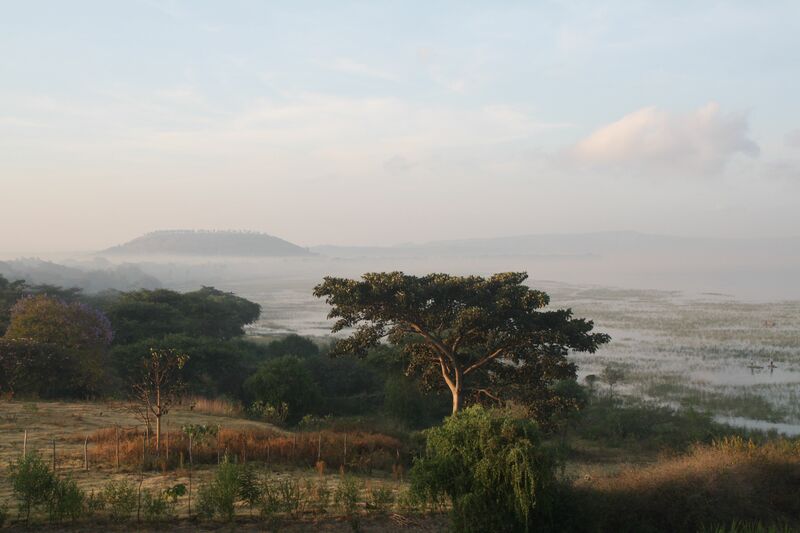 There was a wonderful fog over the lake, and some of the Acacia were flowering. The amount of lush green was much different south of Addis, and things became even more lush when we went further south to Dilla. It was like our trip to Utah with the different “video game levels” of scenery, but amplified. If you look closely, you’ll see a few people in the lower right on those little stand-on boats. We went to a fish market later in the morning, after seeing the hippos and hung out with some monkeys, a stork-like bird the locals called malibu, and otherworldly pelicans. We think we need to retire on Lake Awassa. We had the yellow label, which is a lighter injera. The green label apparently has more of the whole wheat flours. The injera we had in Ethiopia wasn’t that dark, though I gather that Teff can be different shades depending on where and/or how it is grown. That isn’t entirely clear to me, though we did see many Teff fields and even brought some of the wheat home with us. That picture was taken from your balcony?? Breath taking Ben. I am learing so much and getting a bigger picture of your travels. I too, say thanks for sharing. Hope to see more! Really , I meant learning, I am not learing at anything!! AWWWW!!! WOW!!!!!! That is so cool. What an inspiring post !